1. The hand tool which is based on using of the piezoelectric transducer. Weight of the tool is 3 kg and it is easy to use. A number of types of working heads was designed for different industrial application. 2. 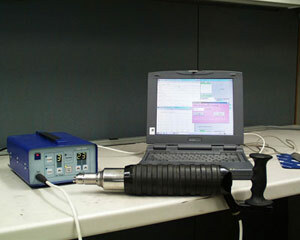 Ultrasonic generator. Weight of the generator is – 3.2 kg with power consumption of only 400 watts. Output frequency – 22 kHz. 3. Laptop with software package for Remote Control and Optimum Application of Ultrasonic Peening – maximum possible increase in fatigue life of welded elements with minimum cost, labour and power consumption. The software was developed based on original predictive model. Units 7-9, 80 Esna Park Dr.